“My Princess” of Alexandru Bunescu with texts signed by Her Royal Highness Crown Princess Margarita of Romania and Mr. Mugur Isărescu, Governor, The National Bank of Romania translated in English, Arabic, Chinese, Russian. 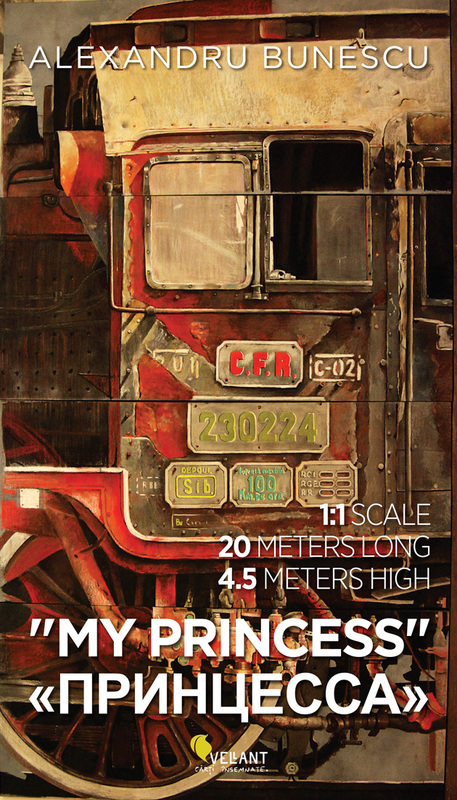 “My Princess” is an artwork made by Alexandru Bunescu and represents, in full size, the steam locomotive that hauled the Royal Train in Romania, Europe. The locomotive is painted at 1:1 scale. The artwork measures 4.5 meters high, 20 meters long and is composed of 32 panels, each 1.12 m x 2.5 m, pastel on canvas. This is the largest contemporary artwork in technical graphics, sold at auctions all around the world. Also, this unexcelled artwork qualified the artist, in 2011, in the top three Artprice’s list (the world leader in art market information) as one of the best-selling contemporary artists under 35 years old. Alexandru Bunescu was born in Sibiu (Romania) in 1988, has a Master’s degree at the University of Art and Design Cluj-Napoca, Romania and was awarded the 2009 Erasmus Scholarship at Eugeniusz Geppert Art and Design Academy, Wroclaw, Poland. He had solo and group exhibitions in Romania, Denmark, Poland, Germany. Currently, he is preparing his PhD at Cluj University and works in Bucharest, Sibiu and Cluj-Napoca.